My mom squad and I often commiserate about how we never get a chance to treat ourselves whether it’s getting our hair done or going to the spa for a relaxing massage or mani/pedi. 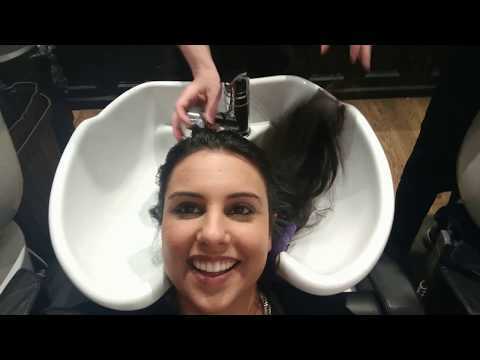 I was ecstatic when Marie Lou&D Salon in Soho, New York invited me and two of my mommy friends, Minila and Rachna, to get pampered. A second home to high-street fashionistas and celebrities like Hilary Duff and Jill Zarin, MLD and its touted European stylists have been featured in InStyle, Vogue, and Marie Claire. We all were treated to consultations with top hair stylists, blow outs, and recommendations on what we should do to maintain our hair based on texture/length/coloring. My hair is fine and very, very long (I don’t get hair cuts, just trims!) I have long layers and got a balayage hair color treatment four years ago that is still going strong (there are strands of caramel/brown that peak through). Hair stylist Tre Wyrosdick, advised that I use Kerastase Elixir Ultime Metamorph oil as a pre-treat before shampooing and conditioning, once a week. The product turns into a milk and penetrates each strand. Leave it in for 2-3 minutes, and then shampoo. To add volume to dull, flat hair, look for shampoos that contain hyaluronic acid and collagen. The Kerastase’s Densifique Bain Densité shampoo and Fondant Densité conditioner add body to thinning hair. Minila is an Indian semi-classical dancer and founder of the Ajna Dance Company. She and her troupe perform a few times a month for TV segments, live shows, and private events and they’re often straightening, curling, and putting up their hairs in intricate up-dos which has left her hair dry and damaged at the ends. Shu Uemura’s Urban Moisture Hydro-Nourishing Treatment for dry hair adds intense nourishment and moisture to parched strands. The lightweight formula enters the hair fiber to soften and smoothe while protecting against future dryness. Recommended for normal to thick hair, the hair mask leaves hair tamed, detangled, and shiny with a healthy glow. Rachna is a a marketing executive who travels a lot. She prefers quick fixes to keep her tresses manageable with plenty of volume. Shu Uemura’s Texture Wave Dry Finishing Spray provides buildable texture with long-lasting, flexible hold. It leaves hair with a soft, matte finish which is ideal for any hair type or length. The spray helps to build volume and movement in fine hair, helping you achieve that perfect blow-out look. By absorbing oil at the roots without any powdery residue, it feels especially rejuvenating on second-day hair much like a dry shampoo. We all loved our salon-ready hair and were happy to know that we could easily achieve results at home with the right products. #MomWin!